The story of Alexander Zhigulin resembles a fairy tale to some extent. Starting playing basketball quite by chance because of his high height in his native village of Osakarovka, which is between the capital city and Karaganda, he suddenly gained the status of the most promising Kazakhstan player. By the age of 16, Zhigulin had managed to play in two professional clubs, won the silver medals of the Asian Youth Championship, visited the World Championships and got on a pencil Barcelona scouts themselves. After spending five years in Spain, Zhigulin returned to his homeland last year and signed a contract with «Astana». In late April, this talented athlete will turn 23, and a representative of the famous American agency handles his affairs. In an interview with «Astana» Presidential Club Alexander Zhigulin told his difficult, but very interesting story. - The village of Osakarovka in the Karaganda region has about ten thousand inhabitants. Ten years ago, when you at the age of 12-13 got in a big basketball, there were even fewer. Honestly, it reminds a Cinderella fairy tale, a few years have passed and you found yourself in Barcelona. - At that moment I had such a feeling. I had a hurricane of emotions. When I had this offer, I was shocked. I thought a lot about how I would go abroad, especially for a long time. I was quite young yet. Well, not without incidents, but finally I went there. Before the offer had arrived, I spent there a week for a screening and a couple of months later they called me and told me to pack my belongings. I took advice from my relatives. I thought – if I left Osakarovka for Kapshagay, why not go to Barcelona? (Laughs) They met me there, supported me, helped me with any questions I had. Young people were very well supported there. - Didn’t you think at that moment — now I am going to become Michael Jordan? - To be honest, I was not a fan of basketball until I got involved. I always played volleyball in my village. And they invited me to play basketball only because of the growth. Then, when I started to play … Jordan, of course, is an idol. But I was always impressed by the NBA players and impressed by Carmelo Anthony in particular, who now plays for New York. I am impressed, because I used to play at the same position of the fourth number. He, however, also play the third, and I have never done it. I was not even taught to play the third number. The basketball player in Europe, who has always interested me, is Terrence Morris. He once played for CSKA, then for Barcelona. I even managed to practice with him a little bit together, because I was invited to train for the first team. I liked him because he also played in the fourth position, but he makes everything in the game so easy! He has amazing effortlessness in his movement, ease in throwing, and a great understanding of the game. I liked how he decides how he gives the pass. I thought — I want to play in the same position and I want to play the same way! - Did you meet Jordan, too? - In 2009, I was invited to attend the Jordan Brand Classic in Vilnius, there were 40 players from Europe. I was the only one from Kazakhstan. Then they selected the top ten, and I got there, to participate in the All Star in New York, Madison Square Garden. They gave us a uniform, basketball shoes, we were so happy! And in New York there was an unforgettable meeting with Jordan, practices, and NBA stars. Carter came to us when we played bowling during an entertainment program. My team, by the way, won the All Star Game. And participation in it influenced the fact that I was invited to «Barcelona». - Tell us about the period when you made a leap from the Kazakh village to the top club. First you got in Kapchagay team roster, right? - What do you mean by that? - I did not know what professional basketball shoes were like. (Laughs) I just did not know that! In «Kapchagay» there were an adult team and a youth team. And by the way, the youth team was divided into three age categories, and the girl team as well. At that time, it was one of the best places in basketball for young people in Kazakhstan. There were both good coaches and conditions for practice. We lived in a rented apartment, there was a woman who cooked for us and helped us. In «Kapchagay» Alexander Ivanovich Aksinenko, who was the coach of the adult team, began to work with me. Such a tough and controlling coach he was. But he taught us not only to be good basketball players, but to be good persons too. I needed such a person in my young years. Three years later, the sponsor had difficulties and the financing of the team had stopped. Nevertheless the team played for next six months in the championship, and Aksinenko invested a great deal of his own money. And after this season the backbone of the team, including myself, left for Kostanay «Tobol». There I played half a season and went to Barcelona. - Did you catch the eye of the scouts during the games for the National Team? - Yes, I did well at the Youth World Championship in New Zealand, and after that I was noticed and sent an official invitation. - Did you have to pay Tobol a penalty of half a million tenge? - It was all right. The contract was torn up on my initiative; I had to pay a penalty. - You were impressed by the shoes in the Kapchagay. What have surprised you in Barcelona? - There is, of course, a completely different level: another level of attitude to sport, to life itself. But it's one of the basketball grandees in Europe, so there is everything. And you just practice and play. For example, I had tonsillitis very often there, which was severe. And I was told at the club that at the end of the season tonsils would be removed. And the very next day after the end of the season they take me to the hospital, and I had an operation. I flew home only after I had completely recovered. The club covered all the expenses. Of course, it surprised me after Kazakhstan. - Did you live on the base? - For the first six months I lived in the residence, this is the type of a base. It was at the Camp Nou. I watched football matches there. So I'm still a fan of «Barsa». Then I lived in the apartments that the club rented for me. They were always nearby the residence. Then the residence from «Camp Nou» was moved to a sports town, they built a brand new base. There was even a dining room there. - In fact, it was possible to not spend at all, even on food? - In fact, yes. But we went out with the guys to restaurants and to the movies. - Did you have fans? - Well, not personal ones. I played in the junior team, in the second roster of «Barca». If people knew that I was from “Barca”, I was photographed and was asked for an autograph. But there was no such frenzied fanaticism. Now, if I played in the first team, it would be a different matter. - Why did not you get into the first team then? - The second team of «Barca», it was called «Barca B», plays in the second league, which is, by the way, is a very good league. We were constantly engaged in practices, at the training camps with the first team. But the transition to the first team is very difficult. Roughly speaking, almost none of the second team gets to the first team. «Because it's “Barça.» They can sign a player who can win the Euroleague alone. They would better sign the 30-year-old champion of the Euroleague. Yes, they engage youth, but you will be in the second lineup. Then my contract expired, I played there for two years overall, and then I decided to change the team. Because the second roster was already sent to the third one, we constantly dissented from one league to even a lower level; the guys from the junior team came up to substitute and immediately got into the second team. And after the season I received an offer from Huesca, Aragon. - Are you considered a legionnaire in Spain? - No. If you play three years in the youth team, then you are not a foreign player anymore. If I go to Spain now, I will not be a legionnaire; I'll play like a domestic payer. - Did you learn Spanish during those years? -Yes, I learned Spanish. And now I can speak it easily, and I talk with the agent Spanish. I was learning the language for the first six months. I had a tutor, who taught me, and then, after a break, I had more Spanish lessons. All the expenses were paid by Barcelona. I studied for eight months overall. Now I can speak, write, read in Spanish. - Did you really call Figulin in Spain? - Yes, this has to do with the Spanish transcription. My surname is written as Zhigulin. And in Spanish Z is read as «C», and the second H is not pronounced. So they pronounce it as Sigulin, Figulin. -When did the agent appear in your life? - So, do you have one of the coolest agents on the team right now? - In “BDA Sports” there are a lot of NBA stars, famous European players. And my agent is the main representative in Europe. He has a lot of good players. I appreciate the fact that he was interested in me. - So, you have played for five years in Spain. Your invitation to «Astana» in Kazakhstan was discussed for a long time, but what other options did you have? - There were proposals from Spanish clubs. But I missed the house; I wanted to be closer to the family. After all, VTB is a very good league, very promising, and one of the strongest in Europe. In general, when «Astana» was found, it certainly made me very happy. This undoubtedly gave impetus to the development of basketball. Although, as a whole, the situation in the country is not very good at the moment, as there are only three teams in National League – “Astana”, «Barcy» and «Caspiy. « In order to host the Final Four «Tobol» from the Higher League has to be invited. We, probably, played around eight matches with every team this season. I hope the situation will change. I would like other clubs to be able to stand alongside “Astana”, but this does not depend on «Astana». Astana has done everything that depends on it. The fate of other teams is in the hands of the regions. - You attended the opening of the Children's Academy in Astana, what are your impressions? - It was perfect. Undoubtedly Astana city needs such a sports academy, especially for the perspectives of «Astana» club. Let the academy have every success. The more the young guys come, the better. Let there be new perspectives for the children, let the new talents to be opened. It's really a very cool project! - It would be cool to have own arena too, right? - I like the cycle track, but it doesn’t belong to us. And it leaks. Every year we have to relocate our games. Sometimes we play in Karaganda, if there are problems with the track. Recently, the National League games took place at Nazarbayev University, because the cycle track was taken for the celebration of Nauryz. If we had our own arena, it would be really cool. - Not so long ago you have taken part in the Cup of Kazakhstan, which you won without the participation of foreign players. How easy was it? - It was interesting, exciting. We tried to prove that the best Kazakhstan players play in «Astana» and we did it. - There is still Final Four of National League ahead, where there will also be virtually no foreign players. How important is it to be rehabilitated for the last season, when you did not become champions? - The past season must be forgotten like a terrible dream. We have not lost even once to “Barsy” and “Caspiy” this season. But our first opponent will be «Tobol» from the Higher League. It won’t be easy, because «Astana» is always got up for the game in a special way. But we need to win by all the means. - There are only a few games left before the end of the regular season of the VTB United League. Currently Astana stands eighth, and in the playoffs there are exactly eight teams. You can see that the team does not have any jitters in this regard. - Yes, it probably true. All I can say is that any game in the VTB League is difficult. The result will depend on team spirit, how we reveal ourselves in the game. It is realistic to win all the remaining games, and we will try to do it. - Can you remember when you have recently looked at someone from the bottom up? - Yes, I watch that way in every game. (Laughs) I'm now playing center, basically, around all the guys are bigger, more powerful. But in everyday life I can’t recall anything like that. In my family, I am the tallest, I'm the tallest among my friends, and I’m the tallest when I walk down the street. In general, it always was that way from my school years. When I started playing basketball, was already 192-194 centimeters long. Now I am 205 cm, and I hope, I won’t grow up any more. - Where do you experience the greatest discomfort associated with your size? - In an airplane. It's horrible. I have very bad knee pain after the flights. The only place in the plane, where it is more or less convenient for me, is emergency seats. The team is flying mainly through Moscow. It takes 3 — 3.5 hours on the plane to take you to Moscow, and then you change for another transfer. This is the most tiring thing that can be there! But in the team bus it is ok, I take two seats for myself and can pull the legs! 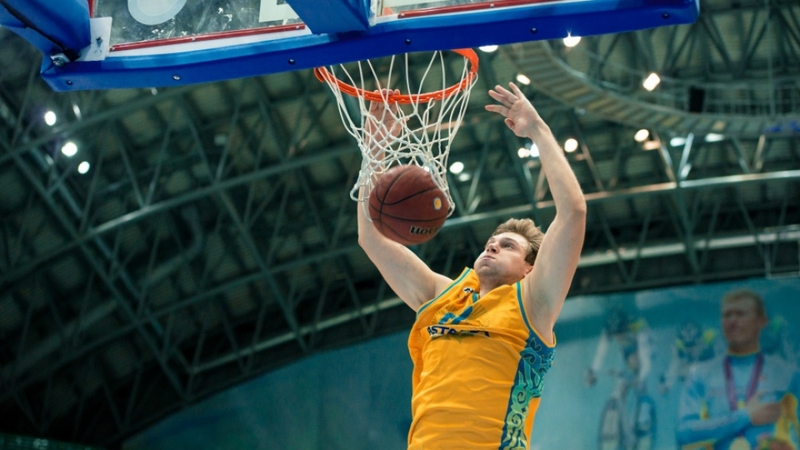 - What are the dreams of the basketball player Alexander Zhigulin? - The only dream is to be a high-level player, to achieve some results in life, to try yourself on the international arena, to become a professional player one of a kind.